Niki Koulouris is a poet of the ocean, of the sea with its wide blue horizon. 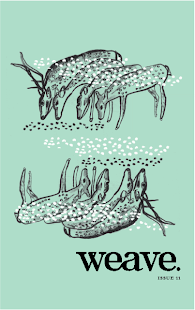 Although the vast, expansive ocean may be intimidating to those born inland, with only rivers and lakes to dip their toes in, Koulouris’s debut collection of poems easily draws in readers. Perhaps it is the shared love for bodies of water; perhaps we can recognize the rhythms of water found deep in these lyrics. Certainly, Koulouris’s lines and images, tight and terse, flow with “the likeness of the waves” and create a remarkable and daring collection. Here we can see the rising tide of her book—the short lines slowly expanding, the pacing of the syllables, even the careful use of articles to control the rhythm. The lines creep up on readers, tentatively, only to suddenly crash into us. Like waves, they then slowly pull back into the poem’s body. This rhythm is fairly consistent, and even the few poems that play with form use the formal repetition to create a sense of water coming in and out. This consistency then binds the book’s two disparate sections. Koulouris’s book is comprised of forty-four poems. Most are shorter than a page and contain barely a half dozen or so words per line. Each poem is numbered rather than titled and they are separated into two untitled sections. The poems rarely use punctuation or capitalization. When they do, they occur only when the lines’ structures are not enough to convey syntax. 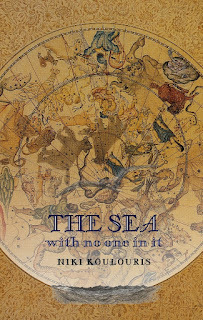 In the book’s first section, twenty poems create a catalogue of the sea. The second section, with twenty-four poems, is comprised mostly of ekphrastic poems with a few sea/water images scattered throughout. This changes with poem No. 39 when the sea returns as the dominant poetic vehicle. At first glance, her poems are reminiscent of William Carlos Williams’s most famous poems. They are crafted with short lines that use pitch-perfect and evocative descriptions. In poem No. 12, for example, she writes about “the steak of Africa / the broken comma / of New Zealand.” And in No. 8, she describes the Aegean Sea as “the colour of a stork.” A Whitman-esque poet might unpack that image, spending a handful of lines stretching the stork metaphor until it snaps. But Koulouris is confident enough to let it hover there, allowing the reader to ponder this rich and unique image. And it is an earned confidence. That final couplet seems to come from nowhere, but it is a remarkable conclusion. She evokes a regret of not fully knowing the sea because it can never be ours, a regret of not tasting her waters and not touching her shores. There is something entrancing about Koulouris’s poetry. It makes readers want to dive deep within it, to drown. Its rhythms are intoxicating and, like a riptide, refuse to let go. The surface appearance of simplicity belies the poems’ complex and daunting depth. “It is always midnight / in the river / between two poems,” Koulouris writes in No. 44, the final poem. There may be rivers between her poems, but they are, indeed, oceans.